Markus Beerbaum and Tequila de Lile. Photos © Sportfot. Wellington, FL – January 29, 2017 – It was a win on the final day for Markus Beerbaum (GER) and Tequila de Lile in the $35,000 Suncast® 1.50m Championship Jumper Classic during week three of the 2017 Winter Equestrian Festival (WEF), sponsored by Adequan®, at the Palm Beach International Equestrian Center (PBIEC) in Wellington, FL. Course designer Luc Musette (BEL) finished out week three with 47 entries in Sunday’s 1.50m Classic and a ten-horse jump-off with six double clear rounds. Katie Dinan (USA) was first to clear the jump-off track, finishing sixth aboard Grant Road Partners’ Galan S, with a time of 45.09 seconds. Richie Moloney (IRL) clocked the fifth place time of 44.24 seconds riding Equinimity LLC’s Button Sitte. 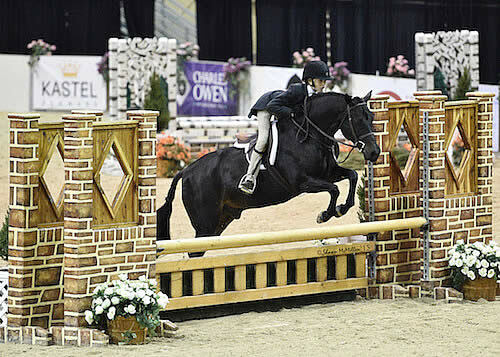 Laura Kraut (USA) placed fourth, riding Cherry Knoll Farm’s Constable II through the timers in 41.25 seconds. Daniel Bluman (ISR) guided Bacara d’Archonfosse, owned by Bluman, Kim Douglas, and Alex Schwitzer, to third place in 40.24 seconds. Kent Farrington (USA) took the lead in 39.69 seconds riding his own and Robin Parsky’s Gazelle, but the best was yet to come, as Beerbaum and Tequila de Lile crossed the timers one 1/100th of a second faster to take the win in 39.68 seconds. Tequila de Lile, a 10-year-old Selle Francais mare (Luccianno x Etna Paulelle) owned by Artemis Equestrian Farm, began with Beerbaum in 2014. The European Championships and World Equestrian Games team gold medalist began developing the mare as a seven-year-old and feels that she is now stepping up to the next level. The Beerbaums are keeping it all in the family, as Markus’s wife, Meredith Michaels-Beerbaum, also won the $35,000 Suncast® 1.50m Championship Jumper Classic just one week ago riding her young mare Daisy. Michaels-Beerbaum, who earned a team bronze medal at this summer’s Olympic Games, also finished second in Saturday night’s $130,000 Adequan® Grand Prix CSI 3* with Comanche 28. Also competing in the International Arena on Sunday, Taylor St. Jacques and Qantar des Etisses won the $10,000 SJHOF Sleepy P Ranch High Junior Jumper Classic. Hannah Patten and Curby du Seigneur topped the $10,000 Equiline Medium Amateur-Owner Jumper Classic. On Sunday morning, Sophie Gochman of Palm Beach, FL captured both the championship and reserve honors in the Small Junior Hunters 15 & Under. She rode Dominik to the champion title and Mythical to reserve. Both horses are owned by Gochman Sport Horses LLC. Aboard Dominik, Gochman won the stake, handy, and under saddle classes, and earned second and fifth places over fences. Dominik is a nine-year-old Warmblood gelding that Gochman has ridden for the past year. During the 2016 show season, Scott Stewart also showed the gelding in in the Second Year Green Hunter division. Mythical, a 13-year-old Westphalian gelding by Cornet Obolensky, has been in the Gochman family for several years now. Sophie Gochman’s mother, Becky Gochman, previously showed him in the Amateur-Owner Hunters before giving the ride to Sophie two years ago. Gochman navigated Mythical to first and second place finishes over fences, second place in the stake, fourth place in the handy, and third place under saddle. Gochman has been coming to the Winter Equestrian Festival (WEF) for eight years now and enjoys the opportunity to encounter riders from all over world here at WEF. “There are so many people, so many international riders. It’s really great because you get to see all these different cultures and the different styles of riding,” Gochman detailed. The 2017 Winter Equestrian Festival continues with its fourth week of competition, sponsored by Ariat®, on February 1-5, 2017. The week’s highlights include the $35,000 Ruby et Violette WEF Challenge Cup Round 4 on Thursday, February 2, the $35,000 Suncast® 1.50m Championship Jumper Classic and Great Charity Challenge, presented by Fidelity Investments®, on Saturday, February 4, as well as the $216,000 Ariat® Grand Prix CSI 4* on the grass field at Equestrian Village at PBIEC on Sunday, February 5, at 3 p.m. For full results and more information, please visit www.PBIEC.com. Bit of Love and Sophie Gochman. Photos by Shawn McMillen Photography. Upper Marlboro, Maryland – The Capital Challenge Horse Show, presented by World Equestrian Center, featured the smallest athletes on Saturday morning and afternoon. Capturing the Grand Pony Hunter Championship was Sophie Gochman, riding Dr. Betsee Parker’s Bit of Love. In the evening session, Sandra Zimmerli and Zaza won the $10,000 North American Junior/Amateur-Owner Jumper Challenge Cup Final Round, sponsored by Johnson Horse Transportation and the overall Challenge Cup, sponsored by Ariat International. The Capital Challenge Horse Show, held at the Prince George’s Equestrian Center in Upper Marlboro, MD, concludes on Sunday, October 9. Every class of the show is live streamed and available to watch online at tv.coth.com or www.capitalchallenge.org. Thirteen-year-old Sophie Gochman of Palm Beach, FL stepped into the winner’s circle for top honors for the second year in a row. She rode Bit of Love, a 10-year-old Welsh Pony Cross gelding by English Lad, to the Small Pony Hunter championship, sponsored by Mike and Alexandra Borissoff Wright, with two firsts, two seconds, and a fourth. Alexa Lignelli and IParty were the reserve champions. They won the under saddle and were second, third, and fifth over fences. The champion in the Large Pony Hunters was Timeless, ridden by 12-year-old Erica Felder of Durham, NC for owner Victoria Haynes. They won two over fences classes and placed second in the under saddle. The reserve championship went to Small Soldier, ridden by Augusta Iwasaki and owned by Iwasaki & Reilly, who won the under saddle and was second in two over fences classes. 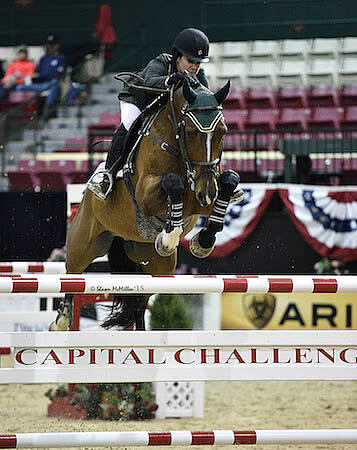 Sandra Zimmerli (18) of Fairfax Station, VA first sat on Zaza, a 12-year-old Holsteiner mare by Casco owned by River Farm Sporthorses, four days ago, but the chance meeting led to a first-time win for Zimmerli at Capital Challenge. Zaza is available for lease, and owner Haley Schaufeld asked Zimmerli if she could show the mare here. For additional information, full results, and live stream coverage from Capital Challenge, please visit www.capitalchallenge.org. Sophie Gochman and Love Me Tender. ©ShawnMcMillenPhotography. Upper Marlboro, MD – Talented ponies ruled the roost today at Capital Challenge Horse Show (CCHS) presented by Well Placed Smile, with Small, Medium, and Large pony divisions honoring their respective champion and reserve combinations for top performances. Sophie Gochman of New York, NY captured the prestigious Grand Champion Pony Hunter aboard Love Me Tender, owned by Dr. Betsee Parker of Middleburg, VA, while Farah Rizvi of Greenwich, CT and Trillville, owned by Peacock Ridge LLC, were victorious in the $2,500 WCHR Pony Challenge. Danielle Torano of Wellington, FL and Herault topped the final round of the $10,000 North American Jr./AO Jumper Challenge presented by Johnson Horse Transportation. Emma Kurtz of Hudson, OH and All My Love, owned by Dr. Betsee Parker of Middleburg, VA, followed Mimi Gochman with reserve honors in the Large Pony Hunter division. Farah Rizvi rode a beautiful round in the $2,500 WCHR Pony Challenge, piloting Trillville to top honors in the class, which boasted 26 entries. Rizvi finished on a score of 87.66, while Kathryn McCarthy of New Canaan, CT and Canterbrook Prince Charming placed second with a score of 84.33, while Adam Edgar of Leesburg, VA and One More Time completed the top three with a score of 83.58. 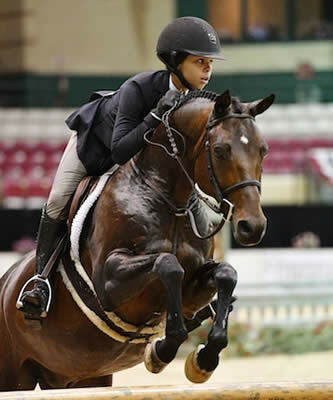 Dabbling in several equestrian disciplines, Rizvi chose to forgo competing in the pony divisions last year and focused on showing her Children’s Hunter mount and her Children’s Jumper horse. She also began to follow in her mother’s footsteps and tried her hand at dressage, which she truly enjoyed. Danielle Torano of Wellington, FL and Herault sped to the finish of the $10,000 North American Jr./AO Jumper Challenge presented by Johnson Horse Transportation, which attracted 26 entries, as the duo stopped the jump-off timers in 36.902 seconds for the win. Cloe Hymowitz of Bridgehampton, NY and Romance De Kerliven finished in second with a time of 37.803 seconds while Torano piloted her second mount into the top three as Callas 2 was just a few milliseconds slower than Hymowitz with a time of 37.895 seconds for third. The class saw nine entries move forward to the jump-off round. Tomorrow concludes the final day of the 2015 Capital Challenge Horse Show, showcasing Junior Hunter riders and Children’s Hunter competition. For more information on Capital Challenge Horse Show and to view a full show schedule, please visit www.capitalchallenge.org. The entire show will be live streamed via EquestrianCounsel.com CCHS Live Webcast, which can be found at www.capitalchallenge.org. In its 22nd year, the Capital Challenge Horse Show sets itself apart with a distinct and unique focus on preeminent hunter competition. Held each autumn at the Prince George’s Equestrian Center in Upper Marlboro, MD, this year’s show will take place on September 26 – October 4. In addition to several prestigious equitation events, the Capital Challenge Horse Show will once again host the World Champion Hunter Rider Finals and will assemble the country’s best horses and riders to compete in junior, amateur, and professional hunter classes. Lexington, KY – August 9, 2015 – Beginning early Sunday morning, 174 young riders and their ponies took their turns around the Alltech Arena at the Kentucky Horse Park Friday, with each hoping to claim the coveted honor of Marshall & Sterling/USEF Pony Medal Champion by day’s end. Ultimately, it was Sophie Gochman aboard Rico Suave who outshone the rest to take the top prize following two seamless over fences trips and a stand-out performance in the additional flat testing. After the first phase course, 25 riders and their mounts returned to the limelight for one more trip around the natural track. Having whittled down the field to the top contenders, it was only fitting that the equitation course increased in both options and difficulty level. After starting with a diagonal four-stride line, the riders were already faced with an inside or outside fence option at the third effort, which then affected the long approach to the ivy-covered oxer headed towards the gate. A left-hand rollback gave way to another sharp turn in the opposite direction to a two-stride oxer-to-vertical combination, followed by a turn option to the subsequent vertical. The final fence once again presented riders with a jump option. Gochman opted for all of the reasonable inside tracks, undoubtedly showing off her equitation ability and the pony’s handiness. “The courses were challenging, especially the long four-stride line and several of the rollbacks. The second course had a lot of rollbacks, and you had to be very careful to land on the correct lead or to get the change quickly. Luckily, Rico is very good at getting his lead changes, which made it a bit easier,” Gochman stated. The 12-year-old from New York City may have believed the course to have its fair share of challenges, but she hid it well, conquering the tough track and consistently impressing judges Frank Madden and Ken Smith. “She had two of the most consistent rounds of the day, and she was quite good on the flat, so all of that combined put her at the top for us,” echoed Smith. The young Gochman was quick to note that it was a team effort that contributed to her win, sharing thank yous by the handful just outside the ring, still dressed in the traditional champion garb with a blue sash hanging off her shoulder. Gochman had a repertoire of ponies to choose from but felt that Rico Suave, ‘Rico’ for short, was her best bet at a top placing in the Medal class. Owned by Ponies & Palms Show Stables out of Boca Raton, Florida, the small pony had been one of the 12-year-old’s trusty mounts for two years, and on Sunday, it looked like her choice paid off. Another vital member of Gochman’s support team, trainer Scott Stewart, was right by her side throughout both rounds of competition and the flatwork test, offering useful help to keep the young talent riding her best. Gochman plans to revel in her win a bit longer, but soon the young talent will turn her eyes to the next competition on the horizon. She hopes to qualify for the pony classes at the Washington International Horse Show during the Indoor season and eventually move on to the open equitation classes when she “gets a bit bigger.” With many more junior years ahead of her, Gochman is certainly one to keep on the radar. Boasting another strong performance, Natalie Jayne of Elgin, Illinois earned the title of reserve champion. Third place went to Grace Debney of Hamden, Massachusetts, followed by Ellia Giuliani of Middleburg, Virginia in the fourth spot. Jenna Drago of Aurora, Ohio and Jennifer Staniloff of Setauket, New York rounded out the final two top six spots. The USEF Pony Finals fun came to an end on Sunday, but competition will continue this week at the Kentucky Horse Park with the Bluegrass Festival Horse Show beginning on Tuesday, August 11. To learn more about the USEF Pony Finals, please visit www.ponyfinals.org, and to find out more about all of the Kentucky Summer Horse Shows, go to www.kentuckyhorseshows.com. Lexington, Ky. – A week of competition at the 2015 US Pony Finals came to a close Sunday with the most coveted award of the championship. The Marshall & Sterling/US Pony Medal Finals took place in the Alltech Arena with 165 riders vying for top honors in front of judges Frank Madden and Ken Smith. After an especially beautiful first round, Sophie Gochman earned the Marshall & Sterling/US Pony Medal Finals Championship title. In round one the riders were tested over a demanding course designed by Marc Donovan and Bobby Murphy. Twenty-five riders were called back for round two over a more difficult track to test their equitation skills. After round two, five riders, two from the Small section and three from the Medium section, returned to the ring to be tested on the flat. Gochman, Grace Debney, Jenna Drago, Ellia Giuliani, and Natalie Jayne entered the Alltech Arena to determine the top placings of the Marshall & Sterling/US Pony Medal Finals. In the test, riders were first asked to show walk, posting trot, sitting trot, and canter before reversing direction. Twelve-year-old Gochman (New York, N.Y.) displayed her proficient equitation to be named the winner and receive the Gold medal in the 2015 Marshall & Sterling/US Pony Medal Finals. Gochman noted that the courses were well-designed and brought out the best in her riding. Eleven-year-old Jayne (Elgin, Ill.) received the Silver medal. The Bronze medal went to 11-year-old Debney (Hampden, Ma.). 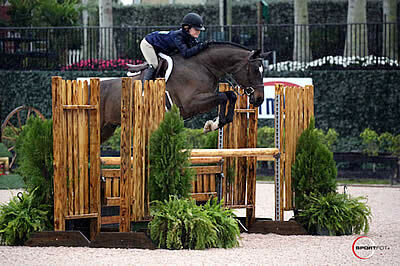 Thirteen-year-old Giuliani (Middleburg, Va.), the oldest rider in the final field of five, earned fourth place, while 12-year-old Janna Drago (Aurora, Ohio) came in fifth. On-demand video highlights, as well as competition recaps, are available at www.usefnetwork.com. For results and more, visit www.usefconnect.com..